Before I reveal the 5 best beaches, keep in mind that this list is according to yours truly. You may have your own favorites and I am sure those are great too. What I love about Plum Bay is that it’s quiet. There may be days when you have a few people scattered over the beach but you will mostly have it all to yourself, especially during the week. For those of you who call the great US of A home, a fun little tidbit about this beach: Your new President Elect, the Donald reportedly has a home right on Plum Bay and it’s HUGE! Adjacent to Plum Bay you will find Long Bay, home of more multi million dollar homes and the island’s only true 5 star resort, the Belmond La Samanna. Ladies and gentleman, it’s called Long Bay for a reason. It is one long stretch of white sands and beautiful turquoise water. Like Plum Bay it is accessible by boat or through the highly upscale neighborhood of Terres Basse or Lowlands, which means passing through security at the gates. Fun fact: You can easily walk from Plum to Long Bay and back as the two actually meet at a point sticking out into the ocean just after Mr. Trump’s palace. By far the Dutch side residents’ favorite beach, Mullet Bay offers the clearest water and the sandiest beach. It is truly enchanting and one cannot just spend a few hours here. It takes a day to really soak in how special this beach really is. So, why isn’t it my number one? Well, I’m probably the only one to feel this way about Mullet Bay but this beach is usually very busy with tourists and locals alike. Definitely a beach to avoid on Sundays and holidays, if you like a mostly quiet atmosphere. I usually do not like posting anything negative but I cannot for the life of me recommend Daleo’s Snack, the beach bar all the way to the right in the below picture. They have the best little corner on the beach and their barbecue is phenomenal but I have never ever in my life had such terrible service. Such a shame, really. From busy beach to a hidden gem. When I say hidden, I mean hidden. Only accessible by boat, via a trail from neighboring beach Friar’s Bay or by trespassing on private property through an abandoned housing community, Happy Bay is one of the most beautiful beaches on the island. I dare say that the fact that it not easy to access is one major reason for it. Apparently hidden also means clothing optional, a fact I was not completely aware or prepared for when I got there. All I can say is Happy Bay is uhm, well, very Happy. It is well known that I am a sucker for the little fishing village of Grand Case on French St. Martin and most of my Instagram beach photos were take on the Grand Case beach. I just love this beach on a quiet day when the water is flat and Anguilla seems closer than ever. Lounge with a drink in hand by one of the popular spots like Love Beach, Les Temps de Cerise or Rainbow Beach or enjoy great lunch offered at the many restaurants here and stay for the incredible sunset. This post would just not be complete without mentioning the most popular beach on St. Maarten. Noisy and definitely crowded, Maho Beach is by far the most popular beach on the island and I dare say this side of the Caribbean. Why? Well, here is where the planes land right above your head. Visit here for awesome landings and totally “Instagrammable” photos. Why it didn’t make my top 5? What a lot of people don’t know is that the beach is usually not really there. It can be sandy and gorgeous one day and rocky with hardly any beach the next, depending on the weather. Obviously it also attracts hordes of tourists and being adjacent to the airport it is not exactly the quietest spot for a relaxing day at the beach. To most it is the island’s sexiest beach, and that is not only because part of it is clothing optional. It features some of the island’s best beach bars and there is always a party somewhere on the long stretch of sand. Personally, I am just not a fan of the water here and for some reason it always seems quite windy. Some of you may agree with the above, some of you may not. Which St. Maarten/St. Martin beach should I have included in the top 5 and why? Until the next post. Don’t forget to subscribe to my newsletter for updates and all things island. Feel free to contact me with suggestions on what to blog about next. In the meantime remember to Live, Laugh and Travel. Great post. I agree with your 5 picks of beautiful beaches in Sint Maarten. I went to Maho Beach more than once during my stay on a surprisingly quiet day & on a full day & it was a stark contrast. I loved Orient Beach, it was so pretty I felt like I was in a painting. I stayed close to Mullet Bay but didn’t get a chance to visit the beach & the day I finally had time to visit, it started to rain. 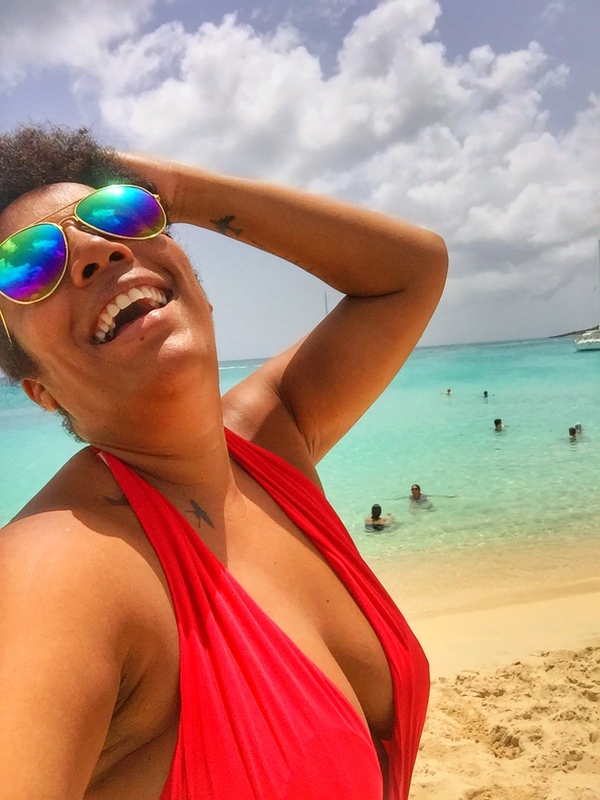 Great post, it will definitely come in handy when I visit St. Maarten/St. Martin again. Mullet Beach is our favorite when we visit the island. We will be visiting the island for Christmas this year so we are hoping to visit some of the spots that you have highlighted. Yes, Sherri, Mullet is the favorite beach of most as it should. I went there again in the name of “research” for this article. Once in that water it is very hard to get out. You have picked a perfect spot to spend Christmas. Great to meet you and Neil on Sunday. Paula, it was such a pleasure.